New York Times culture reporter Dave Itzkoff came into Robin Williams's life right around the same time Marc talked to Robin for WTF. Dave and Marc share notes on what they learned about this one-of-a-kind comedic performer, how his death affected the world, and what Dave was able to glean from working with Robin to write his biography. Then, after their conversation, hear the full interview Marc conducted with Robin back in 2010. This episode is sponsored by Amy Schumer Presents: 3 Girls, 1 Keith, Hearts Beat Loud, and Ben & Jerry's. Robin Williams passed away on August 11, 2014. 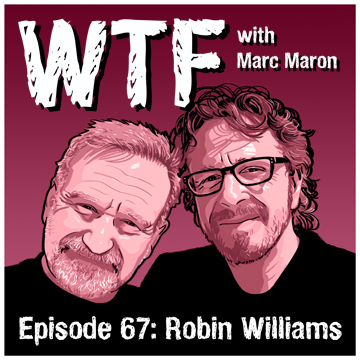 This is Marc’s conversation with Robin from April 26, 2010, as well as Marc’s reflections about the great comedian and actor.